Although seldom grown and seldom seen on the market, both currants and gooseberries are easy to grow. The 'Red Lake' is the best variety of currant. Black currants, popular in Europe, are seldom planted. This is because they are very susceptible to the white pine blister rust, which poses a danger to white pine. 'Pixwell' and 'Welcome' are the two recommended gooseberries. 'Welcome' is very susceptible to powdery mildew and should not be planted unless you are willing to control the disease. Currants and gooseberries should be planted in the spring, with a spacing of about 6 feet between plants. A single plant of each should be adequate. We made the mistake of planting two of each, and we have more fruits than we can use. Keep the plants clean cultivated and weed-free. Pruning consists of removing some of the oldest stems each spring. The best fruits are produced on stems that are two to five years old. Aphids are frequently a problem on red currants. The currant worm often feeds on both currants and gooseberries. All-purpose fruit sprays should take care of these problems if applied as soon as the injury develops. Interest in growing grapes in the area is on the rise. 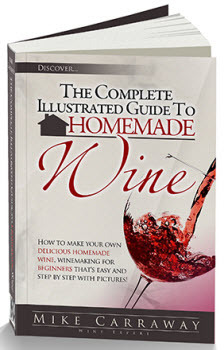 Home wine making provides the chief impetus for growing grapes. 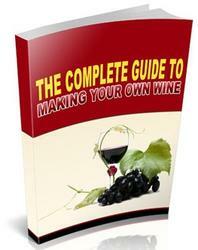 Grapes are of two general types: the American and the European, or French Hybrid, grapes. American grapes have largely been developed from American species. They have a slip-skin and are used for juice, jelly, and wine. Most European grapes are table grapes. They may or may not be seedless, and their skin adheres to the flesh. They can also be used for wine making. Most grapes, including American and European types, are tender and must have winter protection. 'Beta' is hardy without winter protection, and most years the 'Worden' and 'Concord' can be grown without protection. 'Beta', 'Concord', 'Delaware', 'Edelweiss', 'Swenson Red', and 'Worden' are all popular varieties of American grapes. 'DeChaunac', 'Foch', and 'Seyval' are the three recommended varieties of French hybrid grapes, although with winter protection and the proper site, most varieties can be grown. Grapes like full sun and a warm location. Sandy loam soils are best, and a south slope or the south side of a building provides the needed warmth. Before planting, the soil should be enriched with organic matter. Use two-year-old plants and position them a little deeper than they were when growing in the nursery. 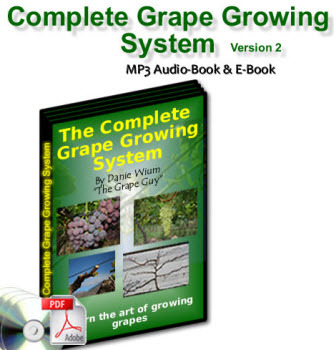 Plant grapes 8 to 10 feet apart and run the rows parallel with the slope. A two- or three-wire trellis is usually provided for support. Keep the rows clean cultivated and use a fertilizer high in nitrogen about May 1. About a half-pound per plant, applied in a band about 2 feet from the base, should be adequate. Avoid late cultivation, for it might encourage late growth. Hardy grapes should be pruned in late winter or early spring before growth starts. The cut vines will "bleed," but this does not seem to matter. Grapes are produced on one-year-old canes. Each bud should produce from one to three clusters of grapes. For maximum production of quality grapes, only about 40 buds are needed. If you use a two-wire trellis, train your grapes with a single upright stem. Select four vigorous side branches and remove all the remaining growth. The selected side branches should be located so they can be tied to the wires with two branches on each wire growing in opposite directions. Shorten each side branch to 10 buds. Tie the canes securely to the wires. If you use a three-wire trellis, select six canes and shorten each to seven buds. There are various ways to protect tender grapes. One method is to tie a vigorous cane to the lower wire. Each bud will develop a lateral branch. These should be tied to the upper wires as they develop. In the fall, about November 1, cut each of the vertical branches back to two or three buds, and remove the cane from the wire. Dig a trench out from the base of the plant. The trench should be long enough to accommodate the pruned cane, and it should be made the depth and width of a spade. Lay the cane in the trench and cover with soil. Later in the month, add a mulch of clean straw or marsh hay. In the spring, lift the canes and tie them to the lower wire. Another method that I have used successfully is to select several canes that grow from the base. Tie these canes in a bundle and lay them in the trench as described above and cover. In the spring, these canes are tied to the wires in a fan-shaped pattern. With either method, aim at keeping no more than 40 buds. As your plants get older, it may be necessary to replace the old canes with young ones that develop from the base. Like other fruits, grapes are susceptible to insect and disease problems. Grape phylloxera and leaf hoppers are the main insect pests. Black rot, a fungus disease that affects both fruits and leaves, is common. Affected fruits become mummied and either fall to the ground or remain on the plant. Powdery mildew and downy mildew can also be a problem. A general purpose fruit spray used at regular intervals will control most of these problems. Birds are fond of ripe grapes. To prevent losses, cover the vines with bird netting as the fruits start to ripen. There is considerable interestin growing blueberries. The highbush blueberries, commonly grown in the East and on the West Coast are not winter hardy in most of our area. They can be grown only with complete winter protection. Even our native, lowbush blueberries are injured in winter with no snow cover. Of the standard highbush varieties. 'Bluetta', 'Bluecrop', 'Blueray', and 'Rancocas' have performed the best at the University of Minnesota's Horticultural Research Center. A few years ago, the University introduced two varieties of low-growing hybrid blueberries with fruits the size of the highbush. These were named 'Northblue' and 'Northsky'. They resulted from a cross between our native lowbush blueberry and the highbush. The advantage of these varieties is that they are easier to protect. Since most blueberry varieties are self-sterile, you should plant two or more varieties. Blueberries must be grown on acid soil with a pH of about 5.5. On neutral or slightly acid soil, mix acid peat with your garden soil. Sulfur, iron sulfate, and aluminum sulfate can also be added to lower the pH. Be careful with aluminum sulfate, because too much of it can cause aluminum toxicity. Usually one application a year is safe. Blueberries like a continuous supply of water, so irrigate during dry spells. A mulch helps conserve moisture. It is best to control weeds by mulching. The plants are shallow-rooted, and cultivation can injure the roots. Well-decomposed sawdust is an excellent mulch. Oak leaves, pine needles, and straw can also be used. If you use a mulch, add a little extra nitrogen to help decompose the organic material. Avoid fertilizers that contain nitrate nitrogen. Better results will be obtained with a fertilizer containing ammonium sulfate. Winter protection can be provided by putting a chicken wire cylinder around each plant and filling it with leaves or straw in November. Planting the blueberries where snow will drift in also helps. There is no better winter protection than snow. Birds love blueberries. If you have just a few plants, it will be necessary to protect them with bird netting.